Think of your biggest printing accounts. In most instances they probably started small. One job, you show what you can do and you deliver the job. From there on you foster the client relationship. So how does that differ with web-2-print? Of course a client’s web-2-print activity could grow over time in the same way as a print account. However it could also progress in a more binary manner – you pitch to the client and you either win or lose. 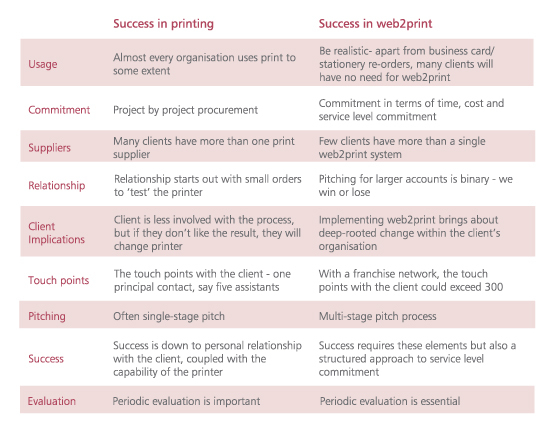 Success in print and success in web-2-print require increasingly different approaches depending on size and complexity of system. Implementing smaller systems does not really need a change of approach to selling print. So how should you formulate your pitch around web-2-print and not simply printing? We’ll be focusing on the pitch process in the coming weeks.